I have a well timed episode of full house for getting Ethan to ride his new bike. 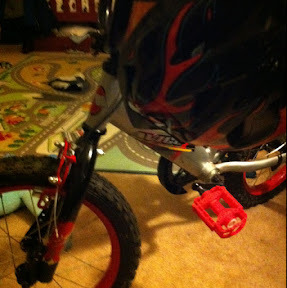 Here's why- We bought EJ a new bike for his birthday. That was back in October. The bike had training wheels and everything. But, someone may have.... Possibly put it together wrong. Well, not wrong... But the training wheels were a little loose. So, he fell the first time and that ruined it for him. He deemed it to hard and dangerous in his mind. That brings us to Kimmie and uncle Joey. We don't usually watch "Full House" at all. But, the channel happened to stop here the other day. So, we watched some good wholesome tv ( not spongebob.) It wound up being the episode where Michele is trying to learn how to ride here bike without training wheels. Well, here first try end similar to Ethan's. She went off into s bush, blamed Joey for letting her go and wouldn't go near the bike. It took them one episode ( a day or two) to get her back on the bike. It took me six months and a half hour episode to get EJ back on that bike. As soon as the show ended I could tell he wanted to give it another try. He was eyeing the bike through the episode. So, I made sure to tighten all the screws and let him go for a few test runs around the house ( sshh don't tell mom.) by the next day his confidence was way up and he was out the door pulling me behind him on that bike. This time I made sure I waited before I let go. Thanks "Full House" fam.